Severed Limbs was formed already back in 1999 by Rogga Johansson with original Paganizer drummer Jocke Ringdahl, but the history was over after just one rehearsal demo in 1999 and another rehearsal demo in 2005. The second demo rehearsal featured Pagaziner, Ribspreader, Blodsrit drummer Matthias Fiebig. More Severed Limbs would probably never have seen the light of day unless the record label Sevared had asked if Rogga had any new material. After putting together an album in 2013 they returned in 2016 with a disc that was even more brutal then the debut. So if you liked the first album you’re gonna love this one, its more of everything. 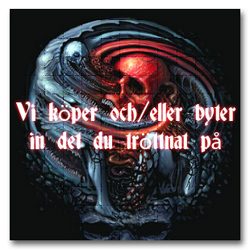 There’s plenty of heaviness and utterly beastly parts, as well as groove and awesome solo work from K. Lynghaug (Grave). This is an old school death metal album out to crash your bones!